Streep simply dives into the role and vanishes. Even her sighs have a Slavic thickness to them and her long speeches of revelation — and in retrospect the film feels like one unending string of them — emerge from a deep, cello-like monotone quite foreign to English speech patterns. 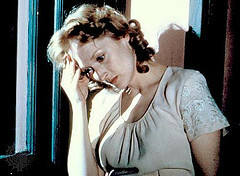 In addition to its challenges for director Alan Pakula, Sophie’s Choice is also a test of other, critical filmmaking arts: camerawork, lighting, costuming and make-up, (particularly cinematography) yet it’s as though each department were carrying on its own love affair with Sophie. . .or with Streep. When she needs to, she looks like a Forties goddess with vivid red lipstick, as vivacious as Carole Lombard. In the camp scenes, her head covered by a scarf she becomes a concentration camp Madonna, seemingly pounds thinner, translucent, with Brancusi modeling to her eye sockets and the planes of her cheeks. Yet, finally Sophie Zawistowska isn’t about linguistics or make-up or cinematography; it’s a mélange of observation, intuition and truth that may come as much from the actress’ unconscious as from her craft. Streep has approached this level two other times, in Out of Africa for director Sydney Pollock, and Ironweed for director Hector Babenco. Ironweed is not a success, at times it’s barely watchable, with all those whitewashed dead folks Babenco dragged in to bring a little magic realism to Depression-era Albany. All I can say is Streep’s work is reward enough for some. For others, it’s the sight of an early Tom Waits, or even her co-star, Jack Nicholson, munching up the wallpaper. As for Out of Africa, who could get anything out of the Baroness Blixen, or at least Blixen as she so carefully chose to present herself: the enigmatic Ice Queen transplanted to hot climes yet still under steely control. Even in a peignoir she had an aristocratic ramrod from her heels to her brain stem. The film is measured enough to try the patience of an oyster and the styles of Streep and her co-star Robert Redford, fatally unable to suggest this enigmatic Englishman, are polar opposites. Yet Streep succeeds. She succeeds best when Klaus-Maria Brandauer is around to give her a run for her money, to match her strength for strength. From some private depths she finds a way to suggest the passion of the woman, passion that pushed even the worldly Karen Blixen to set limits on her free-as-air lover, although she knew what that would do. She uses an accent again, of course, Scandinavian vowels this time. At one of their farewells, Streep’s Blixen says mockingly, “I’m better at hullos,” in a voice that might have come from Garbo. When she plays Ironweed’s derelict, Helen Archer, she doesn’t use cello tones, this is a bass-baritone register, scoured by alcohol. Clearly, these are the last days of a deadly downward spiral yet Streep works to keep them feisty, not fragile, and in that amazing barroom song of hers, “She’s Me Pal” Streep gives her a barrelhouse joy. Helen wears her cloche hat for all but one scene, so we must peer under it to find her and strain to make sense out of the growled fragments that are her sentences. Her mind has hold of the other half of them, and we’re not always privy to its twists and references. It’s a selfless piece of acting, this pink-eyed, shapeless woman of no determinable age. Modest as the role actually is, in terms of time on the screen, Helen Archer is the summation of everything Streep has done and learned up to this point. It may be that as a former theatre actress Streep blooms in an acting ensemble, which Ironweed certainly is, or it may have been simply her fun at keeping the playing field level with that devil Nicholson. This entry was posted in Uncategorized by Sheila Benson. Bookmark the permalink. I am smitten, too. And I’m in complete agreement about Sophie’s Choice! A true tour de force, a phenomenon. It is still shocking how versatile and convincing she was in that film. As you said, utterly loses herself in Sophie’s character(s). I cannot understand why people aren’t talking about it more often today. Perhaps the subject matter is so disturbing, in so many ways, and she so convincing, that they have to put it out of their minds because it is simply too painful and real to dwell on. Recently, we re-watched The Deer Hunter. Amazing again.